If ‘JANUARY’ is ‘JULY’, ‘SEPTEMBER’ is ‘SEPTEMBER then ‘AUGUST’ is ? January has 7 Letters and 7th month is July. 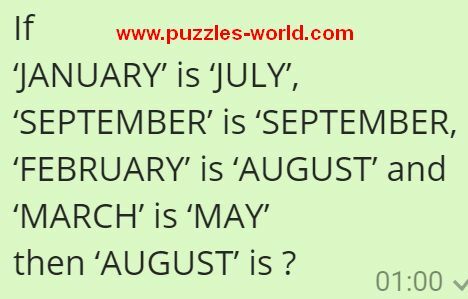 September has 9 Letters and 9th month is September. February has 8 Letters and 8th month is August. March has 5 Letters and 5th month is may. Since August has 6 Letters and 6th month is June.